I have always loved Asian-inspired noodle dishes. If I ever get to travel anywhere in Asia, I will want to eat the real thing every day! This dish comes from Asian Noodles: Deliciously Simple Dishes to Twirl, Slurp and Savor by Nina Simonds. Everything I have made from this cookbook has been good, and this recipe was no exception. I made the recipe as written, except I substituted pork tenderloin for one pound of medium shrimp. The dish would have been more colorful with the shrimp, but not everyone in my family will eat shrimp. We all enjoyed this dish. Even though it was slightly spicy, my 6 year old daughter really seemed to like it. Next time I would use a little less curry powder, or else try to find the “Madras” curry powder called for in the recipe. The leftovers made a tasty lunch! 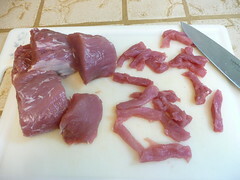 Cut the pork tenderloin crosswise into 1 1/2 inch pieces. Cut each piece lengthwise into thin strips. In a medium bowl, mix together the Chinese rice wine, 2 teaspoons minced ginger, and 1/2 teaspoon sesame oil. Add the pork strips to the marinade and toss to coat. In another bowl, mix together the sauce ingredients and set aside. Heat a wok or heavy skillet over high heat. Add 2 tablespoons of the oil and heat until hot. Add the pork, and stir-fry until cooked through, about 2 minutes. Remove with a slotted spoon and drain in a colander. Wipe out the wok. Reheat the wok, add the remaining 1 1/2 tablespoons oil and heat until very hot. Add the curry powder and stir-fry until fragrant, about 20 seconds. Add the leeks and ginger and stir-fry until slightly limp. 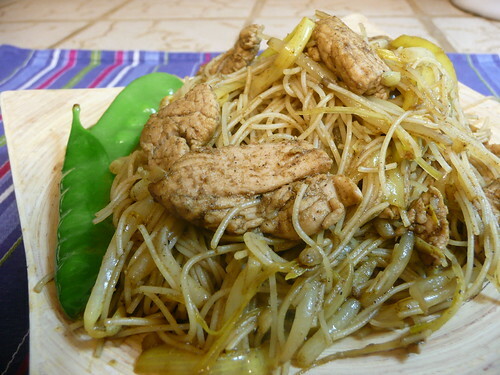 Add the bean sprouts and cook for 20 seconds, then add the pork and rice noodles. Give the sauce a stir and add it to the wok. Toss gently until the noodles have absorbed the sauce and are tender. Transfer to a platter and serve.